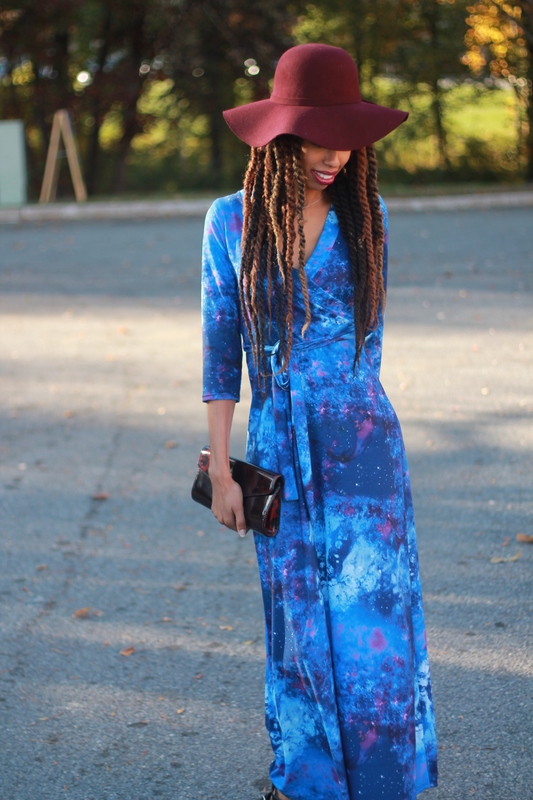 While the galaxy print was a past trend, for me, being out of this world will never end. 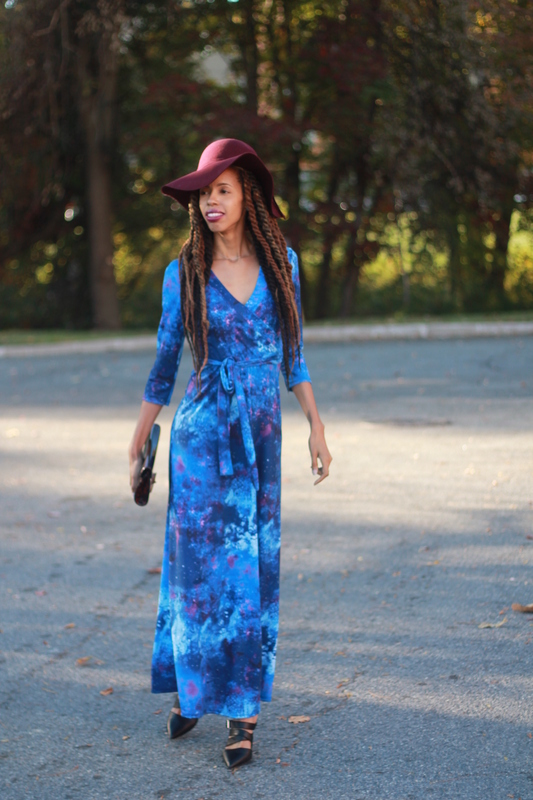 I love maxi dresses, I love dressing up and I love whatever looks great on my naturally thin frame. 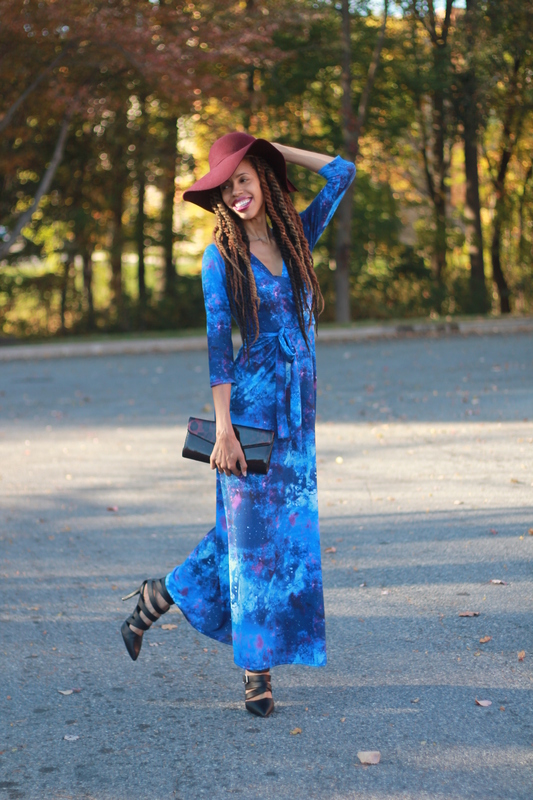 This dress definitely made the cut and paired well with this wool blend hat from Francesca’s. I am also proudly rocking purple with a purpose: October is domestic violence awareness month, a cause dear to my heart. Check out my instagram account for my tips on how to help a friend who is being assaulted in their relationship. I love your blog! Keep up the great entertainment! That dress definitely looks great on you. I love dresses, they’re like outfits in a box. No matching up other pieces is required. I love this look soon much!! I’ve never been a hat person but I am so in love those hats! I want one so bad!! Cute look. 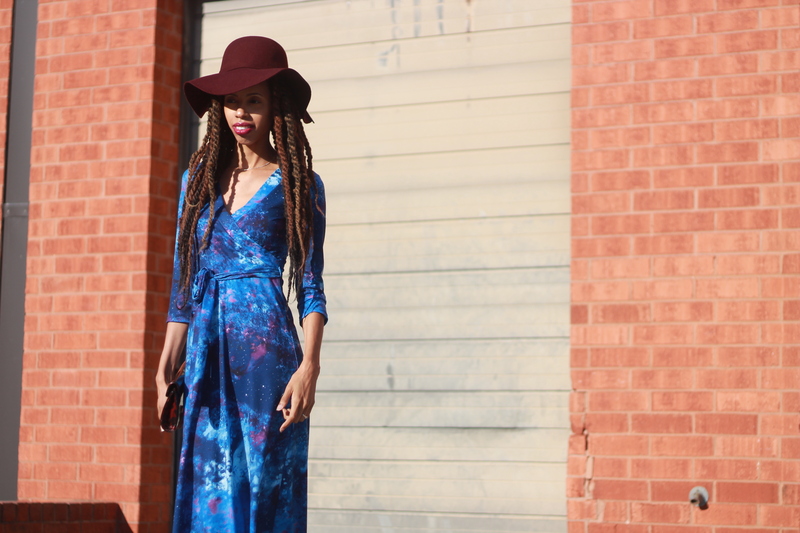 The dress is perfect for you, and I love how the hat just make it Fall ready. 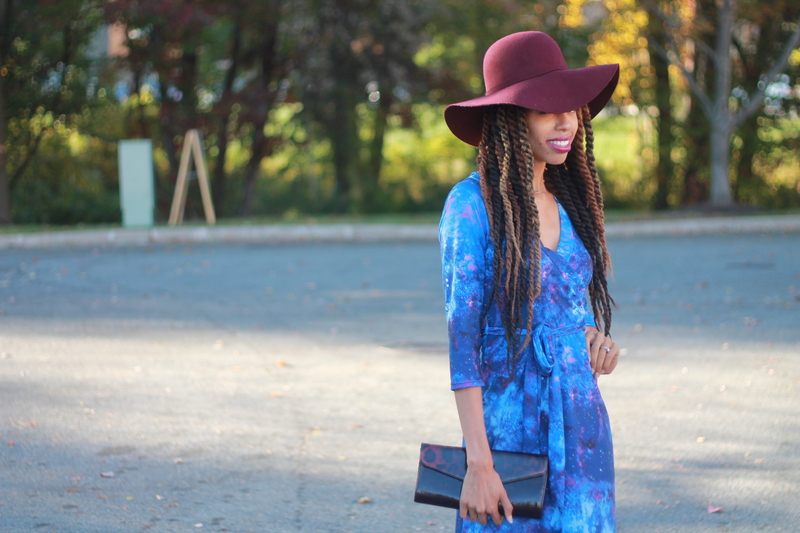 Oh I like the pairing of the funky dress and hat. Very nice style and blog! I love the pairing of the dress and hat. Very nice style and blog! I love the galaxy print on rompers! super cute and fun. Love your look. I love that style of dress, but they never seem to look right on me. You are rocking it though! Love the shoes too! You look very nice. I really like that hat. I so wish I could rock hats, they are so hot. This color is all the rage. 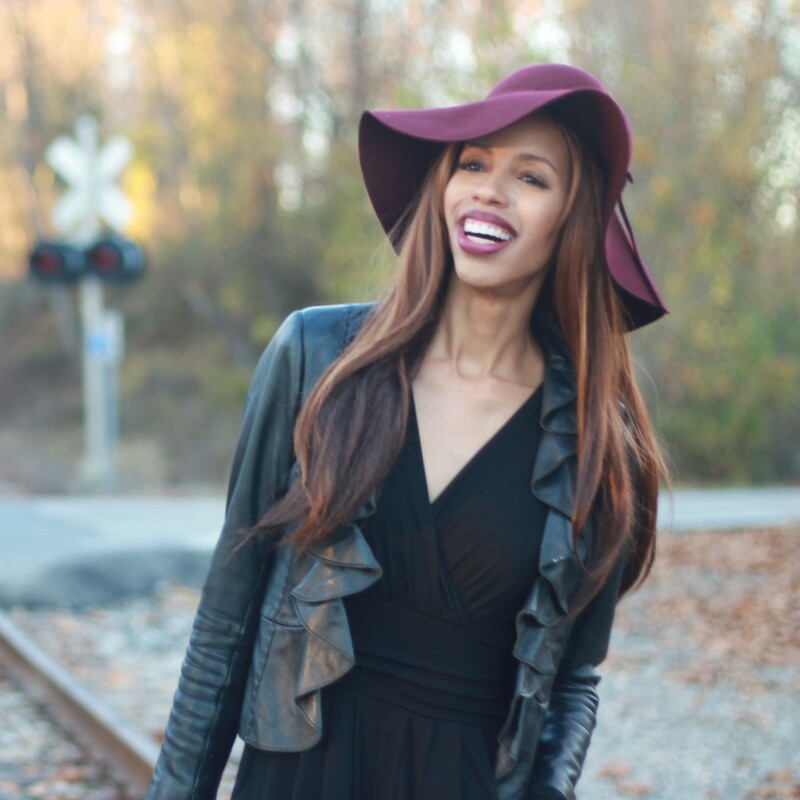 This entry was posted on October 21, 2015 by LaQuisha Hall in All Dressed Up, Brand Ambassador, Dresses, Fabulously Fierce, Francesca's, Hat Attack, Natural Hair Flair, Shoe Dazzle and tagged fashion, hair, natural hair, style.